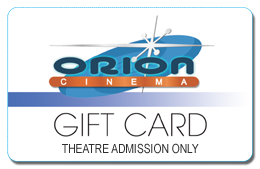 Gift cards from Orion Cinema are a great gift for any occasion. You’ll make anyone who loves the movies smile! Gift cards from Orion Cinema are available in any amount. They are good anytime for theatre admission. Gift envelopes are available for your convenience. To purchase Orion Cinema Gift Cards, just stop by our box office during regular business hours. Need a gift card in a hurry? eGift cards for theatre admission only are now available! Most films are featured with Closed Caption, Audio Description and Hearing Assistance.